The possibility of visiting NCAR has been at the back of our minds for some time, so when the rare honour of invitations to speak at the AGU Fall Meeting in San Francisco plopped into both of our inboxes around June, we swung into action. A couple of months at NCAR rounded off with an easy hop to SF seemed too good an opportunity to miss, so jules sent an email to Bette who leads the paleo group at NCAR to ask if she could host us. There was a bona-fide research reason for the visit, in that we are hoping to extend/supersede this work (and simultaneously improve on this reconstruction!) by blending together model simulations with proxy data records to create a complete reanalysis of the last deglaciation, 21ka to the present. There’s a forthcoming PMIP-supported plan for GCMs to simulate this entire period (the main instigators being next door in Leeds is a happy coincidence), but this may take a couple of years to actually happen, as 21 thousand years of simulation is a huge task for complex models. However, Bette is ahead of the pack having done this a few years ago with a slightly lower resolution model, so our plan was to use her model output (among other things) to work out how to do it in the meantime. Having started to arrange the visit, we then started fishing around for support and found out that NCAR (subsistence) and PEN (travel including AGU costs) were prepared to help us pay for the trip, for which we were and are very grateful. Then to top it off, another invitation arrived, for a workshop on "model dependence and sampling strategies in climate model ensemble prediction"…to be held at NCAR in early December, immediately prior to the AGU! I expect that the organiser Gab Abramowitz was really only inviting me out of politeness with no expectation that I’d fly there for a two day meeting at my own expense (they had no money for this) but of course we were now planning to be there so I was delighted to be able to accept. It then turned out that Reto Knutti was already at NCAR on a year’s sabbatical, and a couple of his ex/current students who were working in this area and are now also supervised by Gab visited briefly en route to the AGU along with Gab. We arrived in mid-October, though our luggage did not. Our departure from Leeds had been a bit disorganised, as the computer system there was down and all check-in/luggage drop had to be by done by hand. The resulting delay gave us a tighter than planned connection at Heathrow (including a terminal change) and therefore it wasn’t a great surprise that our checked baggage with hand-written tags didn’t turn up in Denver. So our first couple of days in Boulder were filled with emergency shopping (along with scrounging some free googlewear off our friend Rob who works there). Fortunately all our stuff turned up over the following week, albeit in 3 separate deliveries all in the middle of the night which did nothing for the jet lag. Most of the luggage consisted of two travelling bicycles (S&S couplers) which we had used some 19 years previously on my first visit to Boulder. That didn’t end so well – for us or the bikes (evidence) – when we met a Harley-Davidson on the wrong side of one of the twisty canyon roads, but fortunately there were no similar incidents this time around. Boulder is great for cycling around, being pretty much flat with a sunny dry climate and a wonderful network of bike/pedestrian paths many of which follow various creeks though and across town. Our apartment was an easy distance for cycling (and sometimes running) to work, 6km direct (though with a 250m climb) with a range of longer options for more energetic days. NCAR also runs their own regular shuttle up to the lab and there’s good public transport in Boulder, so we didn’t plan to hire a car for our stay though thought we might do so for one or two weekend trips to the surrounding countryside and national parks. In fact in the end we forgot to pack our driving licenses so couldn’t do this, which didn’t turn out to be much of a hardship as there was enough to keep us busy in the vicinity of the town. Just outside the town, there are some huge hills to climb and some decent mountain biking. …and the really long way home! NCAR is really well set up for visiting, there were several offices set aside for the use of visitors and we were up and running with ID cards and computers and internet access etc in a couple of hours on our first day, which would not likely have happened at JAMSTEC, or anywhere else we’ve been before. There’s also a very good canteen which we made the most of, even including some breakfasts. NCAR seems to be on everyone’s itinerary – there were many seminars from short-term visitors, and it was quite a surprise to bump into someone we knew from Bristol who was also passing through. So just being there was a good opportunity to meet with a range of people, though in fact our main work on the deglaciation turned out to be largely self-contained. 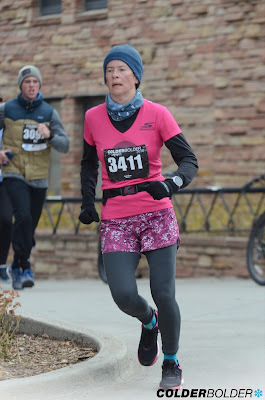 Snow usually appears around the middle of October in Boulder, but we were lucky to arrive during a particularly dry autumn and had a full month of warm sunny weather during which we made full use of Boulder’s various leisure opportunities. We quickly bought some cheap old MTB tyres from Community Cycles and enjoyed visits to Dowdy Draw, the West Magnolia Drive trail area, and Marshall Mesa. We also climbed up most of the mountain roads – Magnolia Drive to Nederland, Flagstaff, through Jamestown to Rob’s place and finally up and down Lee Hill Drive. 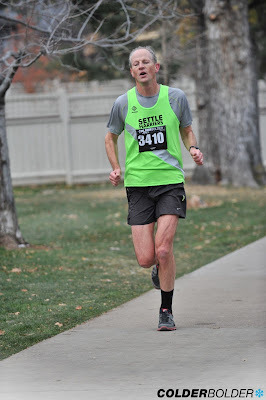 I also found a few of the local running groups and went out for a couple of rather gentle Sunday morning runs with the Boulder Roadrunners and more challenging runs with the Boulder Track Club who seemed to consist of quick to super-fast runners. Luckily the runs were basically out and back routes so I could watch them all zoom off into the distance and after turning round a bit early they would all zoom past me on the way back too. jules and I together joined the Trailrunners for the first hour of one of their monster mountain marathon days. We just went up Flagstaff but most of the rest went all the way to Bear Peak and back, about 24 miles with a lot of climbing. In short, it looks like at a minimum the basic idea should succeed fine but it’s a bit early to say anything about what the overall result will look like, and there are plenty of opportunities for improving on the very simple method we used. It will also be very helpful to get some more PMIP simulations but we may have to wait some time for these, so there’s no great rush for the methodology but we will keep working on it as time allows. Towards the end of our visit, just about when we were starting to get a bit bored with sitting in an office and working on the deglaciation, we had to shift gears to prepare not only for the AGU meeting but also for the workshop on climate model ensembles. In all we had 4 presentations to give on entirely unrelated topics in a bare week (me talking twice, jules once, and a joint poster). I don’t think anything from the workshop is available on the web (it was a rather small and informal affair) but there are plans to write some sort of review paper. There was no real breakthrough but there was hopefully some shared understanding of the different ideas that people have come up with. I’ve also got a month to revise this manuscript, and now have a significant improvement to put in to it. Although the new idea didn’t arise directly at the meeting, having to give a presentation about it and field questions afterwards did provoke the inspiration. Straight after the workshop we flew over to San Francisco for the AGU meeting, about which I’ll write separately. For now you can make do with the view from our hotel window (on the one sunny morning we had). We came back and had a couple of days in Boulder, just enough to empty our office and tidy up the apartment and pack all our stuff for the long haul back to the UK. No drama on that trip, and a bizarre lack of jet lag following our return, perhaps because it’s so peaceful and dark at night here in Settle that there’s really no excuse to stay awake. While we were in the USA, it seemed like there was some sort of election going on. The result didn’t go down well with most (perhaps all!) of the staff at NCAR. I hope the institute survives for other people to have as enjoyable and useful visits as we did! Presently hunkered down at home awaiting the forthcoming -17C minimum temperature overnight, which is something I don't think I have experienced before. Possibly came close to it up a Japanese mountain once or twice. We've been very lucky with the weather for most of our trip, but it's certainly winter now! At the start of December there is the annual “Colder Boulder” race, a counterpart to the “Bolder Boulder” in May that we've run a couple of times before. The December one is only 5k and has many fewer participants, allowing the event centre and finishing area to fit into an indoor arena which is probably a good idea given the season. In the event it was pretty comfortable, a bit chilly but bright and still. 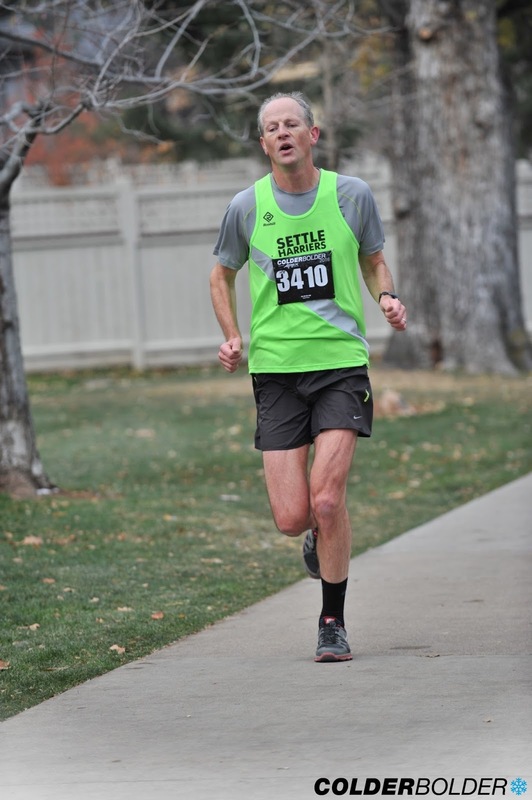 Biggest problem was the altitude, but the modest hills and numerous corners on the course also contributed to a slow run. Oh, and it was a good 100m too long too. Taking account of these factors, I was reasonably satisfied to duck under 20 mins (by a whole second) and jules was also relatively fast at 26:05. In fact we were both the fastest in our respective age categories, thanks mainly to the organisers' decision to classify by year rather than the more usual decade (meaning there were only about 10 runners in each category). We are hoping to reap the benefits of the altitude training when we return to sea level shortly!